If your son is going to play baseball, you're among the leagues of parents who need to purchase youth baseball uniforms. Many teams do a group order for all of the kids' uniforms at once, but some teams and leagues are not that organized, and leave all of the work to each individual parent. 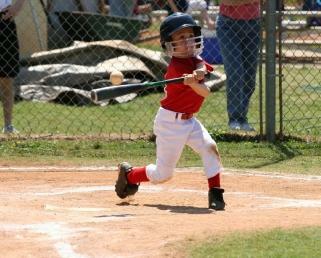 Like football jerseys, baseball uniforms are essential apparel for any boys who play baseball. Whether they play on a school team or a junior team, there will always be some type of uniform required, even if it's only a T-shirt with the name of the team and the child's number on it. While full uniforms are much more exciting for the boys to have and wear, they are also much more expensive than everybody simply having a T-shirt and then wearing a standard pair of baseball pants. T-shirts can be printed very cheaply; a uniform is much more costly, and generally is outgrown by next year's season. One last option that some teams utilize is the option of the team itself having a collection of uniforms that get borrowed by the players each year. In this manner, the kids can each get a uniform that fits them this year, and next year they will have a different, bigger, uniform out of the group collection. While this is a money-saver for the families whose kids play baseball, difficulties can arise when there are more large or small boys this year than there were when the uniforms were initially purchased. Wearing an ill-fitting uniform is uncomfortable, and sometimes even embarrassing. If your particular team or league has each child buy his own uniform, take the following considerations into account when choosing a place from which to buy, as well as the size to buy. Size is an important consideration when buying youth versions of baseball clothing. While the jersey's size is not crucial, the pant size is quite important as pants that are two small can restrict movement. Fabric is another very important thing to consider when buying a uniform for your son. Especially if you live in a very warm climate, the fabric is crucial. Regardless of where you live, the lighter the fabric is the better. On cold days, you can always layer underneath the jersey; on hot days, wearing only the jersey should be comfortable, not stiflingly hot. While it can be difficult to find baseball pants in any other fabric than polyester, baseball jerseys can be found in different weights of polyester, as well as polyester and cotton blends. Going for a higher cotton content means less chance of overheating. Homegrown Sporting Goods offers everything from jerseys and pants to socks and belts. While not all styles are available in youth sizes, there is a sizeable collection of options for youth baseball uniforms. Pricing is reasonable, around $20 per jersey and $25 per pair of pants. At Epic Sports, there are several options in youth sizing. Prices are low, starting at $18 per jersey (quantity discounts drive the price even lower) and starting at $10 for polyester pants. Regardless of where you and your team purchase uniforms, be sure to try to get all the parents and kids together to buy as a group. Not only do quantity discounts apply, but you'll also save on shipping costs and all have 100 percent matching uniforms.